The Ibanez 2018 SRMS806 Multi-Scale Bass Guitar is a superb 6-string bass that is perfect for those already well-versed in extended range models, as well as those stepping up from a 4- or 5-string bass. From the high quality tonewoods to the hard-working appointments, from the elegantly executed multi-scale neck design to tonal versatility on offer, this is a model that punches well above its weight. As we've come to expect from an Ibanez SR series bass, the body is shaped to maximise playing comfort, and enhance your playing experience. Boasting a slim depth couple with elegantly contoured curves, the body induces a figure-hugging playing feel immediately. Whether you like to wear it high, sling it low, play seated or standing, the SRMS806 always feels just right. The SRMS806 is built using mahogany to establish a confident mid to low-end timbre, which is perfect for laying down a smooth tonal foundation. Paired with this is a poplar burl top, which has been treated to a brown topaz burst paintwork that allows the subtle grain of the wood to shine through beautifully. Everything about the SRMS806 finish effuses elegance. Joined to the body is a cool 5-piece jatoba/walnut neck, which is fitted via an extended neck joint to maximise stability throughout the most energetic of performances. Whether you're picking or slapping, the neck can take anything that you throw at it, and keep on coming back for more. The bound panga panga fingerboard promises a luxurious playground to explore. The neck and fingerboard adhere to Ibanez's multi-scale design, which allows each string to have the optimal scale length for improved resonance, sustain, and consistency. Angled fret markers are ergonomically designed to suit the natural position of the hand, resulting in a smoother and more seamless flowing feel across the entire neck. 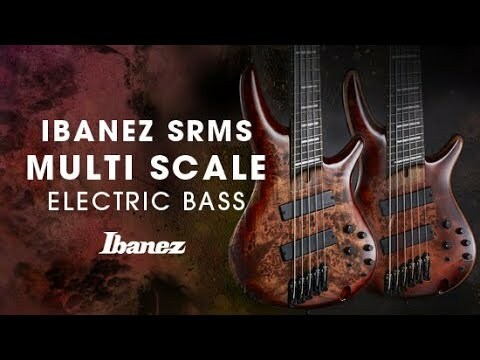 Whether you're familiar with 6-string models or not, Ibanez have crafted the SRMS5 to ensure your fingers become accustomed to the multi-scale design promptly. The SRMS806 is fitted with Bartolini BH2 pickups at the neck and bridge positions, which are designed to translate the transient response of the strings, warmth of the tonewoods, and neck/fingerboard partnership, immaculately. There are a wide range of controls built-in to give you exceptional tone-shaping possibilities. These include Ibanez Custom Electronics 3-band EQ (as well as an EQ bypass switch), and a 3-way mid-frequency switch. Fitted to the body is an MR5S bridge with 16.5mm string spacing, which supports each string securely to improve playing consistency and sustain. The headstock is home to Ibanez tuning machines, which uphold tuning integrity with steadfast precision. The black matte hardware complements the finish.